Everyone's favorite microcontroller has been a boon among hobbyists and advanced amateurs, but it's also found a home among the brilliant projects at MIT's Media Lab, including a groovy instrument called DrumTop. This modern take on the drum pad delivers Arduino-powered interactivity in its simplest form -- hands-on time with ordinary household objects. Simply place a cup, or a plastic ball, even a business card on the DrumTop to make your own original music. The prototype on display today includes eight pads, which are effectively repurposed speakers that tap objects placed on top, with an FSR sensor recognizing physical pressure and turning it into a synchronized beat. There's also a dial in the center that allows you to speed up or slow down the taps, presenting an adjustable tempo. DrumTop is more education tool than DJ beat machine, serving to teach youngsters about the physical properties of household objects, be it a coffee mug, a CD jewel case or a camera battery. But frankly, it's a lot of fun for folks of every age. There's no word on when you might be able to take one home, so for now you'll need to join us on our MIT visit for a closer look. We make music with all of these objects and more in the video after the break. 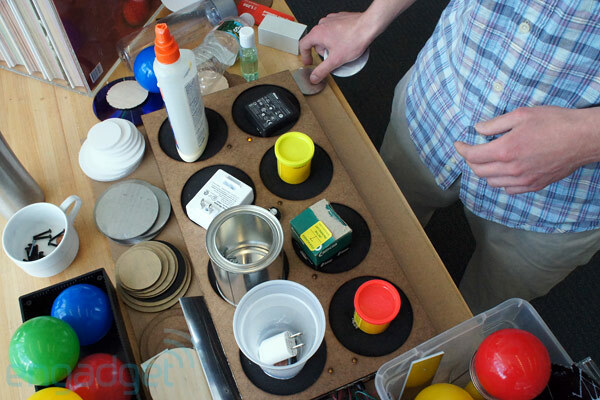 MIT gets musical with Arduino-powered DrumTop, uses household objects as a source of sound originally appeared on Engadget on Tue, 24 Apr 2012 12:35:00 EST. Please see our terms for use of feeds.